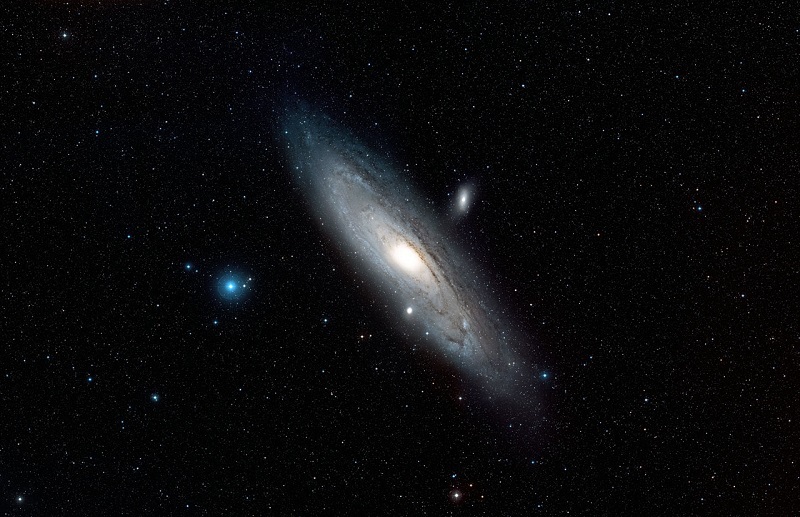 This image (main picture above) shows the full extent of the Andromeda Galaxy, also known as Messier 31 or M 31. The Andromeda Galaxy appears very large in the sky – several times the size of the full moon, although much fainter. Hubble is designed to make highly detailed observations of much smaller patches of sky: the space telescope’s observations of the Andromeda Galaxy show individual stars and clusters rather than the broad spiral structure visible here. Summer skies begin to fade from memory, but autumnal October brings plenty of opportunities for stargazers. First though, don’t forget that towards the end of the month British Summer Time finishes and we revert to Greenwich Mean Time. On a practical level, local clocks go back one hour at 2am on October 28. The week preceding this change, look south-east towards the constellation Orion once it gets properly dark. The Orionids meteor shower, caused by material from Halley’s comet, appear to radiate from near Orion’s right elbow. The shower is fairly reliable, with activity throughout October 20-27 expected, although October 21 and 22 should represent peak activity. Be warned though, the full moon on October 24, though welcome in other ways, is close enough for its brightness to make spotting the meteor shower difficult. Further, Orion will not be high above the horizon until late at night. Less transient then, the planet Mars is low on the horizon towards the south throughout the month in the late evening, with the moon about two degrees away on October 18. Continuing to face South, but looking higher, the great Square of Pegasus is fairly easy to see, as are the bright stars of Cassiopeia. Meanwhile, the stars of the summer triangle, Vega, Altair and Deneb, set in the West as we move deeper into the night, a clear signal that summer is behind us. Over in the east, Taurus is rising, and his red right eye Aldebaran will be easy to spot. The great bull is clashing with Orion the hunter. If you get lost, slope up the line of stars making up Orion’s Belt to find Aldebaran. Finally, between Pegasus and Cassiopeia lies the Andromeda Galaxy. In reality some 2.5 million light years distant, the galaxy will appear as a very faint fuzzy blob. It’s a real trial of your eyesight and the local conditions, but it’s always worth testing yourself and taking the chance to see something far beyond the Milky Way. This seemingly small blob is our nearest large galactic neighbour, and contains somewhere in the region of a trillion stars. Out of this World: Moon Our moon-themed morning includes a planetarium show, interactive quiz and virtual reality activity. Join our Royal Observatory Astronomers for a series of activity packages for older children that include a brain-bending moon quiz, the chance to feel what it’s like to step on to the lunar surface and a rock handling demonstration to show what features to expect on the moon. Holiday to Space The morning starts in our planetarium with our fun filled Space Safari show, filled with spectacular close up views of the planets and a chance to sing along to help Ted find the great big bear. Learn more about Ted’s adventure in this workshop by choosing which planet would make a good holiday destination and helping our brave teddy bear prepare for his stay. Astronomy and Islam: Introduction Join an astronomer for a special planetarium show featuring the new crescent moon and the history of studying it. Held before the predicted sighting of the next New Crescent Moon, a Royal Observatory Greenwich astronomer will guide you through the steps to observe this phase, discuss the difficulties in defining a first sighting and will provide a general overview of the sky this month. Also the astronomer will trace back the study of our nearest cosmic neighbour to Arabic astronomers who helped form our modern understanding of the Moon’s movements and appearance.